Plays through a wooded park with narrow fairways, some elevation and natural obstacles. Three holes right along Duck Creek. Designed from 12 up to 18 in 2017. From I-80, take US67 south 7 miles, right on Devil's Glen Rd., park is on right. 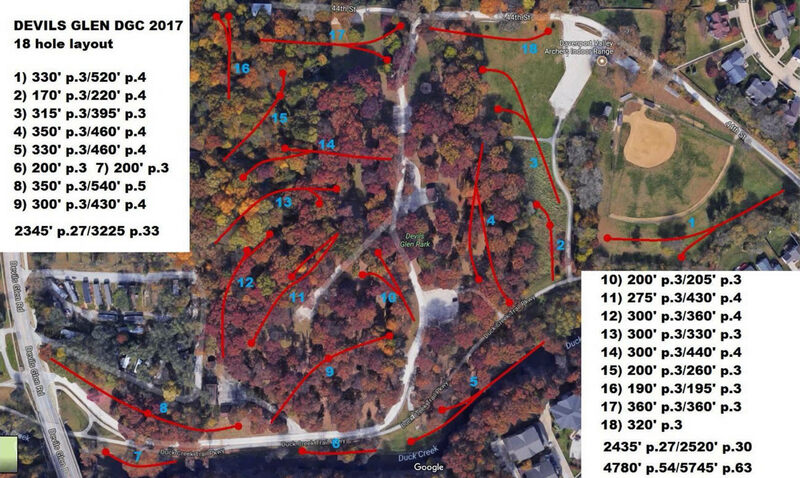 This course could be cool, if they had a map. The 12 holes play through three separate parks. The first tee is up the road from the first parking lot, past the baseball diamond. The first hole plays around behind the baseball field. The course is decent, but finding the tees/baskets was an all day affair. A little map action would really have helped, and the tee signs were cool, WHEN they were there.